Sharing content with thousands of followers at once isn’t the only benefit of social media for business. Small businesses all over the world have been discovering the ways social media can contribute to success and growth in all areas of their companies. However, there are still skeptics who still don’t see or understand the benefits of social media for their business. In this post, we go over 10 benefits of social media for business that will turn skeptics, like your boss (or even yourself! ), into believers. For businesses in any industry, the key to success is knowing your audience. Social media makes this possible, and easier to accomplish than ever. 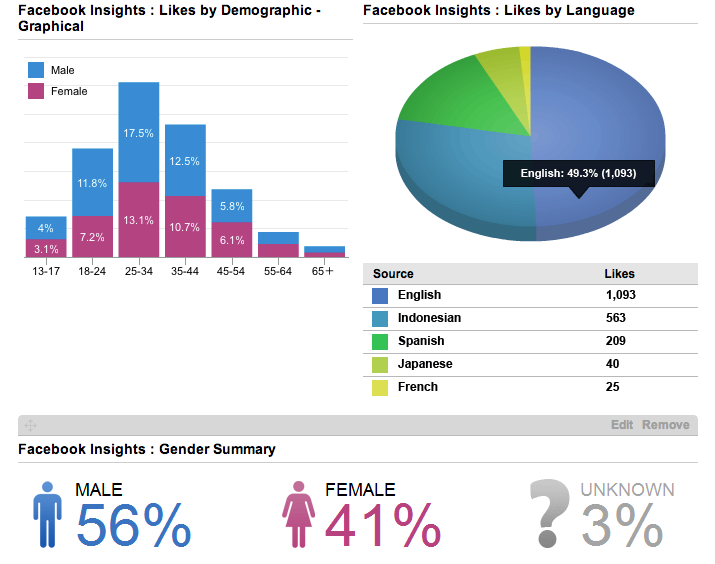 With tools like Facebook Insights in Hootsuite you can learn the dominant languages spoken among your social media audience, as well as their age and gender. This knowledge can help you cater campaigns and product offers to your target audience, which will provide you a better return on investment. Geo-targeting is an effective way to send your message out to a specific audience or demographic based on their location. Social networks like Facebook and Twitter have tools that allow you to communicate the right kind of content to your audience. 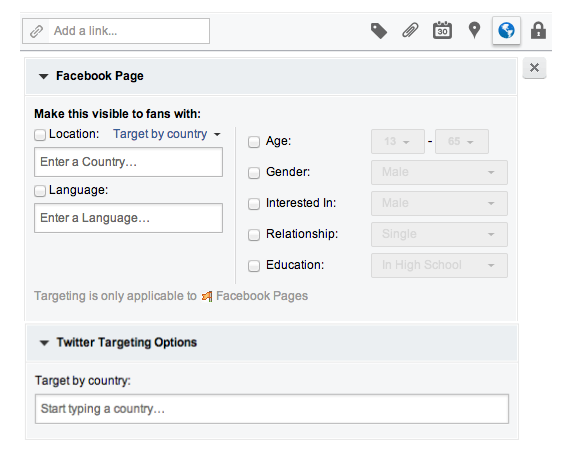 For example, in Hootsuite you can target by ‘Location’, ‘Language’, ‘Age’, ‘Gender’, ‘Relationship status’, ‘Interested in’, and ‘Education’ on Facebook, and ‘Country(s)’ on Twitter. For example, if you want to send out a post to people who speak Spanish, geo-targeting is an easy and effective way to do it. Social networks like Twitter allow small businesses to locate their current customers or seek out potential customers. 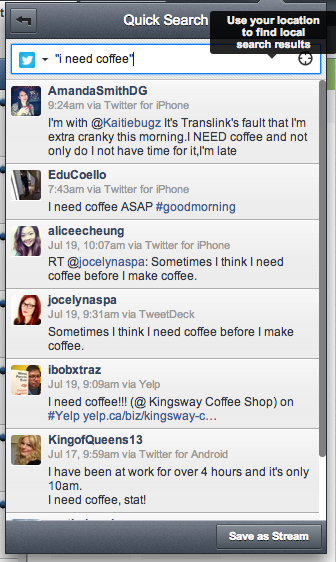 For example, if you open a new coffee shop in the neighbourhood, you can create a geo search in Hootsuite to locate anyone tweeting about needing a morning cup of joe within your area. After locating those tweeting about coffee, you can start reaching out to them, and invite them to come try a hot bevvy at your new coffee shop. Social media for business gives you instant access to positive or negative feedback, which provides you with valuable insights on the customer perspective. For example, if you launch a new product and share it on social media, you’ll instantly learn what your customers think of it. Another way to gain customer perspective with social media is by learning how they use your product; brands often base new products or services on their customers’ original ideas. Below is Contiki Holidays’ take on learning what people feel or think about their experience on a Contiki tour. With social media monitoring you can gain key information on your competitors, therefore improving your market intelligence. This kind of intel will allow you to make strategic business decisions in order to stay ahead of your competition. For example, you can create search streams in Hootsuite to monitor mentions of your competitor’s name or product. Based on your search results, you can improve your business to offer something your competitors are missing. In the past, marketers faced the challenge of ensuring their content reaches their customers in the shortest possible time. With the help of social media, sharing content got easier and faster. When you use social media for business, specifically for sharing content about your business or for content curation, all you need to do is simply share it on your brand’s social network accounts. But keep in mind that getting your customers to share your content with their followers means you need to make sure your social media content aligns to your brand and interests your audience. Social media is an easy way to generate leads. For example, Hootsuite’s marketing department was built around content and social platforms, and Twitter ads has allowed us to scale, increase reach, and fuel demand generation. Hootsuite promotes two types of content via Twitter Ads: ungated content (free content requiring no email address for access) and gated content (free content requiring an email). Sharing gated content on social media is a great way for any company to generate leads. Social media is great for creating meaningful relationships with your customers. For example, social media allows tourism brands to create dialogue with travellers, therefore creating relationships with customers before, during, and after they have booked a trip with the company. This kind of social media dialogue between brands and customers is something traditional advertising will never achieve. Social media for business has allowed companies to increase brand awareness and reach of their brand at little to no cost. The costs associated with these strategies are a lot higher with traditional advertising methods. Recently, marketing departments across companies started hiring community managers to increase brand awareness and reach through social media. Community managers foster relationships with online audiences in different regions. At Hootsuite, we have community managers for each of our three regions: APAC, EMEA, and The Americas. This helps us make sure we keep expanding the reach of our brand to those regions and maintain relationships with key stakeholders. Still not convinced about social media for business? If you’re still not convinced after reading these ten benefits of social media for business, we’ve put together a handy presentation for you. This slide deck focuses on four key areas to help raise even more awareness on the power of social media as a tool to monitor trends, find opportunities for growth, and create advocates for your brand.